We just finished our donor luncheons in Grand Rapids, Michigan and Merrillville, Indiana! Our two Lakota (Sioux) students who told folks about their life at St. Joseph’s were Selena, who just graduated from eighth grade and will enter Chamberlain High School in the fall, and Chandler, who just finished her seventh grade year. On the shores of Lake Michigan. When I asked the girls to share about their hopes and dreams for the future, Selena spoke about going into law enforcement to help make life better for the people at home – the Lower Brule Indian Reservation. Chandler shared that she wanted to go into nursing, possibly as a midwife. Then she added that a dream of hers was to attend college at the University of Notre Dame. On the way from Michigan to Merrillville, we took a slight detour, and went to South Bend! The university was a lot bigger than she imagined. Rather than scaring her off, this excited her more! Whether or not Notre Dame becomes her final decision, when our Native American youngsters talk about college, we try to encourage them to think big and then to prepare themselves by working hard. We took a few pictures by the Golden Dome, and bought some souvenirs in the bookshop. Our time in Michigan included a visit to the Gerald Ford presidential museum, just a few blocks from our hotel. In the evening, we ate at a fun family center that included a pizza buffet, go-carts and bumper car rides. Selena was the daring racer who lapped everyone else, flying by with the biggest grin on her face! After our luncheon on Sunday, we headed up to Chicago. My religious community’s formation house is in Chicago, and with students gone for the summer, there was plenty of room to make that our home base. We spent the next day touring the Windy City. I attended college and graduate school in Chicago, so know and love the city well. It’s always fun to see the sights anew through the eyes of newcomers, and Selena and Chandler were enchanted everywhere they turned. We spent the evening touring the Hyde Park neighborhood, including the University of Chicago and getting our feet wet in Lake Michigan. Even on a hot summer’s day, the water is always icy cold. Then, we picked up some deep dish Chicago pizza and came home to enjoy the feast. Monday, we made our way around the loop, and up the Magnificent Mile. 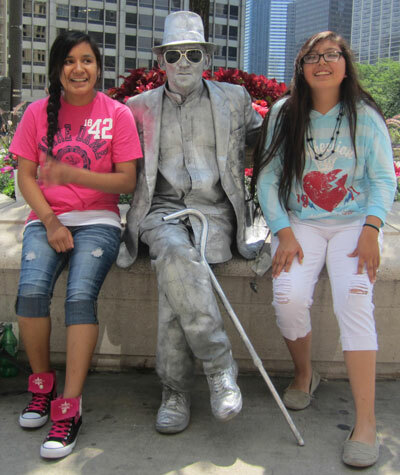 As we walked past a silver statue, the street performer came to life and jumped up next to Selena, who almost jumped over the Wrigley Building! They laughed and got their picture taken with him. Lunch was at Ed Debevic’s. At first, the girls didn’t know what to make of the intentionally rude waiters. But they laughed and enjoyed the outing, especially when our server sang and danced on the table. We made our way to Lincoln Park Zoo. Our staff members were surprised that such a nice a zoo could be free, and enjoyed the lovely scenery and animal antics. Selena and Chandler were startled by a street performer. Besides the girls’ first plane ride on the trip out, they also experienced their first city bus and subway/el rides, and then took a spin on the Navy Pier Ferris Wheel for a great view of the city. The best view we had was standing by Buckingham Fountain in the evening, with patriotic music playing, the mist shooting high into the night, and the city lit up all around us. These were my last two donor luncheons. Most folks have gotten word via email that I will be moving on at the end of the month, so the days were nostalgic and bittersweet. I got so many hugs and congratulations, and cherished the people who care so much about St. Joseph’s Indian School and want to make sure the good work continues. With our committed, passionate staff, I assured them that it would. There are no doubt greater and more exciting things to come after I’ve completed my time there. I have truly loved and enjoyed the chance to meet the people across the country who make the work we do at St. Joseph’s Indian School possible. So many folks make great sacrifices that allow us to run our programs. So many people have never gotten the opportunity to visit up close and personal, so it is a joy to let them meet the students and find out more about all we’re doing. Besides being a blessing to the school, our donors have been a blessing to me personally. Many folks have been praying for my health. A week ago, I was back at Mayo Clinic for my 6-month check in with the oncologists. I’m happy to report a continuing clean bill of health. After running the comprehensive battery of tests, the doctor told me that I can now wait a full year before needing to come back – thanks be to God! 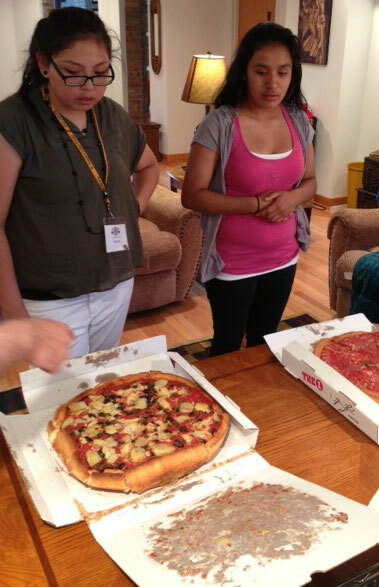 The girls get their first glimpse of Chicago-style deep-dish pizza! 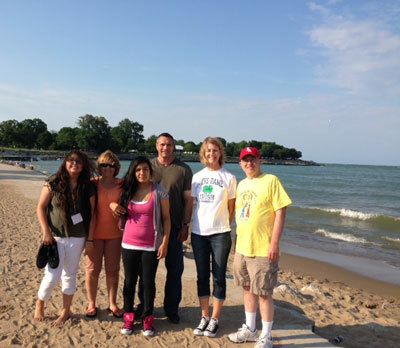 what a wonderful opportunity for Selena and Chandler, and you too, to return to Chicago… thanks for sharing. Happy 4th!